Posted on 20, May 2016 by EuropaWire PR Editors | This entry was posted in Education, Science, United Kingdom and tagged Dr Kaustubh Adhikari, genes that drive the shape of human noses, Professor Andrés Ruiz-Linares, UCL. Bookmark the permalink. LONDON, 20-May-2016 — /EuropaWire/ — Genes that drive the shape of human noses have been identified by a UCL-led study. The four genes mainly affect the width and ‘pointiness’ of noses which vary greatly between different populations. The new information adds to our understanding of how the human face evolved and may help contribute to forensic DNA technologies that build visual profiles based on an individual’s genetic makeup. The study, published today in Nature Communications, analysed a population of over 6,000 people with varied ancestry across Latin America to study the differences in normal facial features and identify the genes which control the shape of the nose and chin. The researchers identified five genes which play a role in controlling the shape of specific facial features. DCHS2, RUNX2, GLI3 and PAX1 affect the width and pointiness of the nose and another gene – EDAR – affects chin protrusion. “Few studies have looked at how normal facial features develop and those that have only looked at European populations, which show less diversity than the group we studied. What we’ve found are specific genes which influence the shape and size of individual features, which hasn’t been seen before. “Finding out the role each gene plays helps us to piece together the evolutionary path from Neanderthal to modern humans. It brings us closer to understanding how genes influence the way we look, which is important for forensics applications,” said the first author of the report, Dr Kaustubh Adhikari, (UCL Cell & Developmental Biology). People have different shaped facial features based on their genetic heritage and this is partly due to how the environment influenced the evolution of the human genome. The nose, for example, is important for regulating the temperature and humidity of the air we breathe in so developed different shapes in warmer and cooler climates. 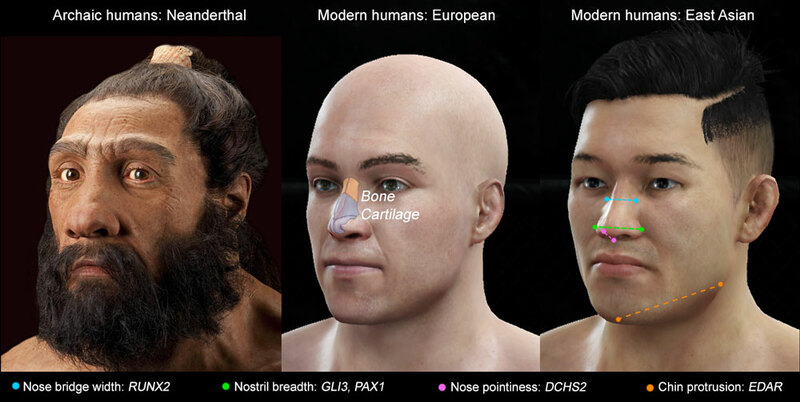 “It has long been speculated that the shape of the nose reflects the environment in which humans evolved. For example, the comparatively narrower nose of Europeans has been proposed to represent an adaptation to a cold, dry climate. Identifying genes affecting nose shape provides us with new tools to examine this question, as well as the evolution of the face in other species. It may also help us understand what goes wrong in genetic disorders involving facial abnormalities,” explained Professor Andrés Ruiz-Linares (UCL Biosciences), who led the study. The team collected and analysed DNA samples from 6,630 volunteers from the CANDELA cohort recruited in Brazil, Colombia, Chile, Mexico and Peru. After an initial screen, a sample size of 5,958 was used. This group included individuals of mixed European (50%), Native American (45%) and African (5%) ancestry, resulting in a large variation in facial features. Both men and women were assessed for 14 different facial features and whole genome analysis identified the genes driving differences in appearance. A subgroup of 3,000 individuals had their features assessed using a 3D reconstruction of the face in order to obtain exact measurements of facial features and the results identified the same genes. The study identified genes that are involved in bone and cartilage growth and the development of the face. GLI3, DCHS2 and PAX1 are all genes known to drive cartilage growth – GLI3 gave the strongest signal for controlling the breadth of nostrils, DCHS2 was found to control nose ‘pointiness’ and PAX1 also influences nostril breadth. RUNX2 which drives bone growth was seen to control nose bridge width. The genes GLI3, DCHS2 and RUNX2 are known to show strong signals of recent selection in modern humans compared to archaic humans such as Neanderthals and Denisovans; GLI3 in particular undergoing rapid evolution. UCL’s contribution to this work was kindly funded by the Biotechnology and Biological Sciences Research Council (BBSRC).